Cosy hostel with a perfect location to visit Paris by foot. A metro station is just around the corner as well as a lot of restaurants and bars. Pretty little hostel located in the very center of the Latin Quarter, on one of the oldest streets in Paris. In five minutes you can easily reach the subway station Place Monge. The check-in is open 24/7, the staff was very friendly and polite and also knew one or the other insider tip. Unfortunately, the price-performance ratio for breakfast was a bit disappointing. In this case, the nearby supermarket at 37 Rue Lacépède is an alternative. Anyway, I can recommend the hostel for a short visit! Pretty cool hostel in the Latin Quarter. Was pretty quiet during the beginning of April! Staff was always friendly and helpful. Fantastische Lage, nette Leute. Ich war sehr zufrieden! Das einzige, was etwas störend war, war die defekte toilettenspülung. Ein Handtuch und Bodentuch hätte ich sehr nützlich gefunden. Positv: Super freundliches und hilfsbereites Personal. Lage des Hostels top. Könnte mir vorstellen wieder zu kommen. Negativ: Auf dem Zimmer fehlt zu jedem Bett eine Steckdose sowie eine Leselampe. Die Dusche zum Zimmer hatte keine Mögloíchkeit um ein Handtuch aufzuhängen bzw um etwas abzustellen. Leider nur ein kleiner Kühlschrank in der Küche. Das ist zu knapp. The hostel is okay. It is perfectly located, the Quartier Latin is really nice and energetic especially at night (which means it can be loud at night). The bathroom was disappointing. There was only one shower for at least 30 people because the second one was broken and that one wasn’t even clean and very small. The rooms were okay but at least the staff was really nice. 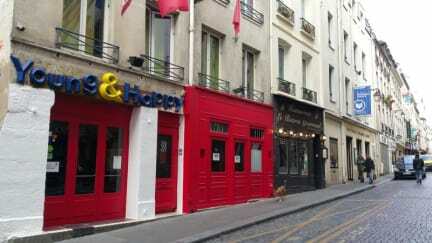 We would recommend this hostel to people who are planing on spending their time exploring Paris and not in the hostel. Very lively area, staff is friendly, I left my luggage there during the day. But the hostel ist squeezed into a very small house and you feel that there is no room for breathing. The showers were dirty and mouldy, there were only a few for the whole hostel and some did not even work. It was not worth 40€ a night, sorry!